Disclosure: I may have been on a sugar high when I wrote this post. Halloween Season is officially here! The time of monsters and scary movies, haunted houses and spooks. 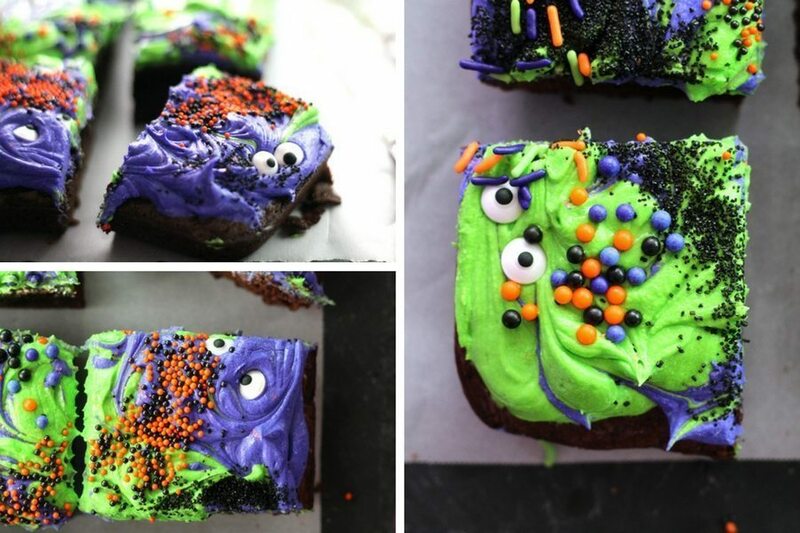 It is also the time for sticky-sweet treats like these Monster Mash Halloween Brownies. Me and my little ghoul-friend made these over the top Halloween brownies together. Holiday baking is family fun in our kitchen. 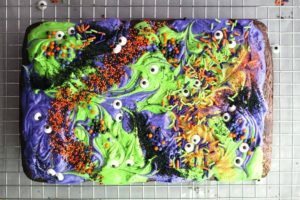 Magically swirled with bright purple and green buttercream on top of fudgy brownies, this treat has a trick inside. 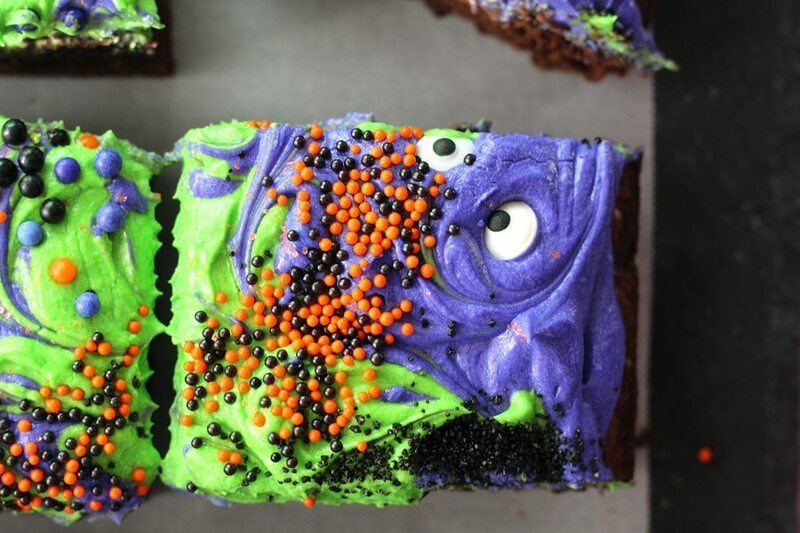 This recipe for Monster Mash Halloween Brownies has a few tricks and a lot of treats. We added a couple of things to our brownie batter to make it extra special. No worries, no toads or eyes of newt or anything like that. Just an extra dose of chocolate covered peanut butter cups. Just mash them right into the brownie batter before baking. Look at these yummy brownies. It was all I could do to keep from eating them totally naked. The brownies…not me. The smell of warm chocolate baking with just a hint of peanut butter…it is enough to drive you mad. But my daughter made me wait. She had to get in on these Monster Mash Halloween Brownies. Looking for more SUPER-SWEETS? Yep, I have a sweet tooth. 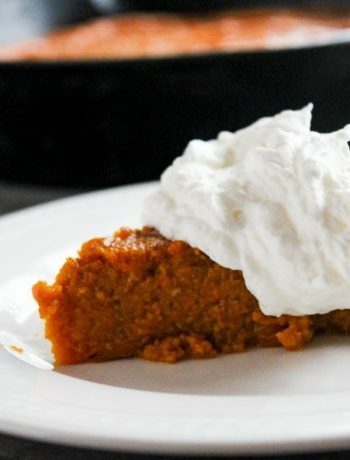 Or are you in search of Savory Halloween Recipes? As soon as my youngest daughter found out what I was up to, she had to get in on the buttercream action. 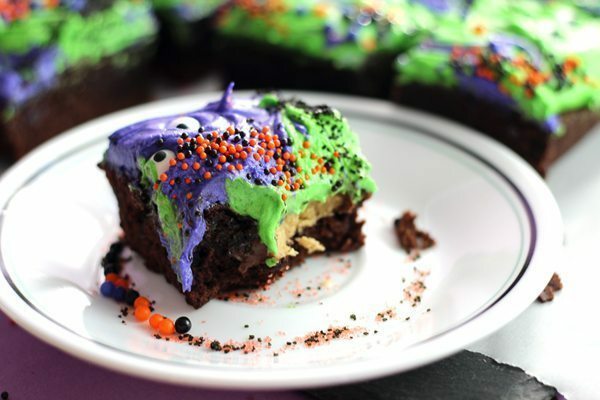 Monster Mash Halloween Brownies are the ultimate recipe to make with your kids. Seriously, does it get any better than mixing up electric-green frosting, playing with colors and all kinds of sprinkles? Trick – To get your brownies out of the pan with no sticking, spray your baking sheet first. Then, line it with parchment paper. Spray the parchment paper with more butter flavored non stick spray. When the brownies are done, let them cool in the pan for about 15 minutes. Then, grasping the edges of the parchment paper, carefully lift and transfer the brownies to a wire rack. and body parts at your grocery store. Load these brownies up with all the treats. And eyeball placement. I really loved that part, too. And making them with my daughter. 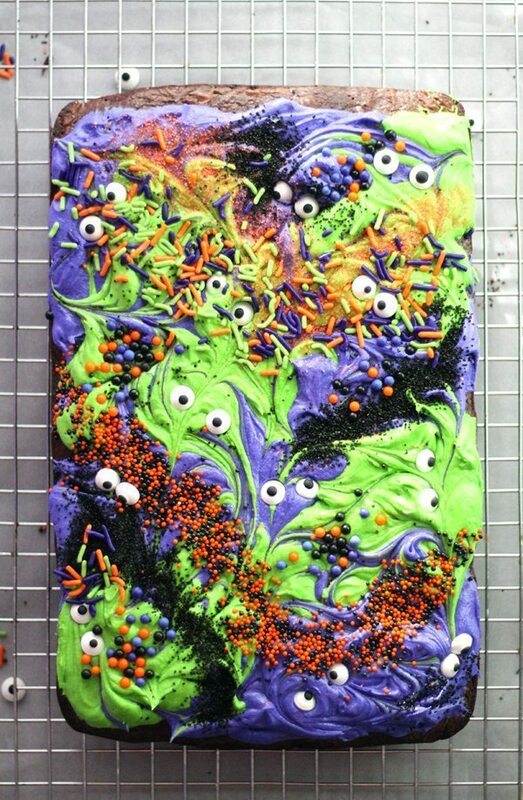 Ok, I love everything about this fun recipe for Monster Mash Halloween Brownies! Love this post? Sign up for the Buy This Cook That Newsletter for a weekly email of new content. You can also follow us on Facebook, Pinterest, Twitter and Instagram for our latest + greatest ideas! Preheat oven to temperature on brownie package. Spray an 8x12 pan with butter flavored non stick spray. Line the pan with parchment paper, and spray the parchment lightly. In a bowl, stir together the brownie mix, eggs, oil, and water until just combined. Spread the brownie batter evenly into the bottom of the prepared baking dish. 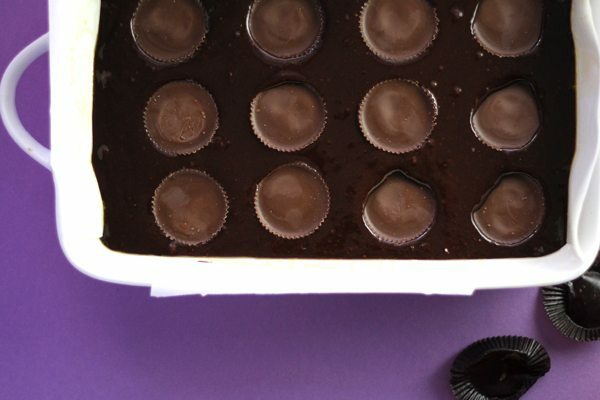 Press the peanut butter cups into the brownie mixture. Bake according to package directions. Cool brownies in the pan for 15 minutes. Carefully grasp the parchment paper and transfer the brownies to a wire rack to cool completely. Place the powdered sugar in a large bowl. With a hand mixer, beat the sugar on low for a minute to break up the lumps. Add the butter and cream cheese, and beat on low to medium low until the mixture is crumbly. Gradually add the vanilla and milk, beating the frosting until desired consistency. Divide the frosting into two smaller bowls. 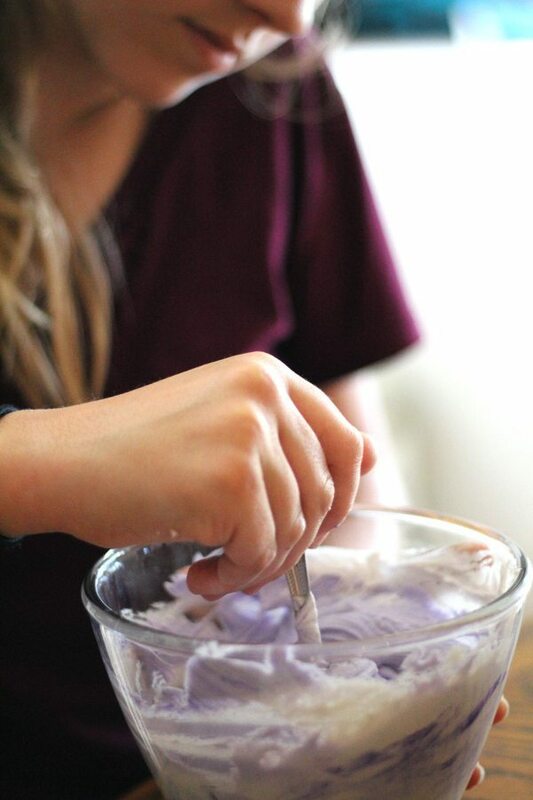 Tint the bowls with gel icing color to desired shade. Stir well to blend. Frost the brownies with a generous amount of icing, alternating colors. 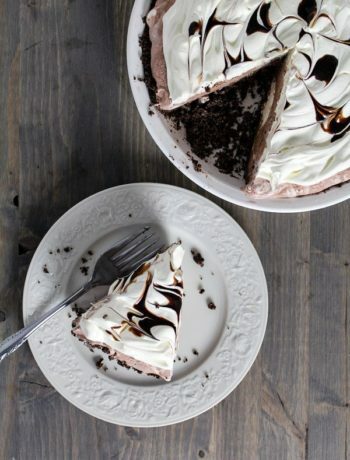 Using a wooden skewer or knife, create a swirl pattern in the frosting. Top with desired sprinkles and candy. Cut into squares and enjoy. I am in a long-term relationship with mojitos, Tennessee football, and cheese. These brownies are so fun! Super fun and super crazy. My daughter and I had so much fun making them. The dog was running around on the floor eating up all the sprinkles we dropped. These look amazing! 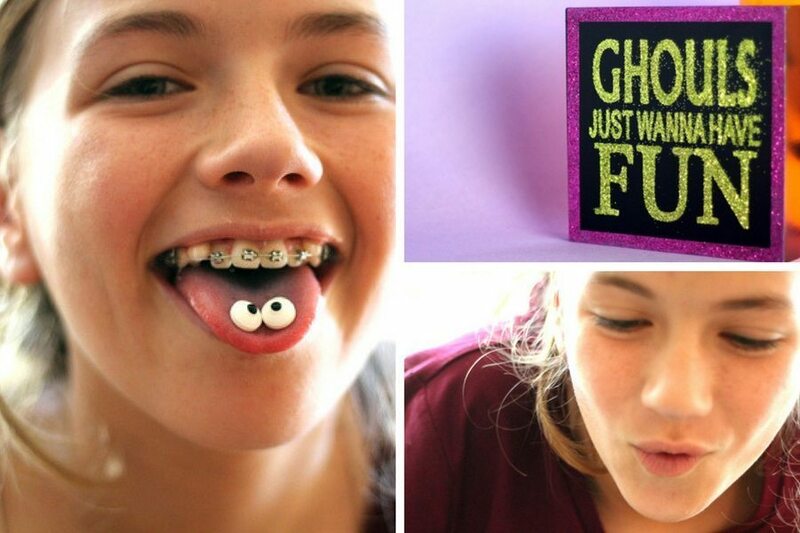 I want to make them for a party. Can I make them tonight and refrigerate or should I just assemble everything tomorrow? That should work great, especially since the brownies will stay moist in the fridge overnight. I haven’t tried it, but I don’t see why it wouldn’t work. I would add the sprinkles and decorations tomorrow. So the colors don’t bleed into the frosting. Thank you! I will do that! Buy This Cook That shares recipes + ideas with busy families. 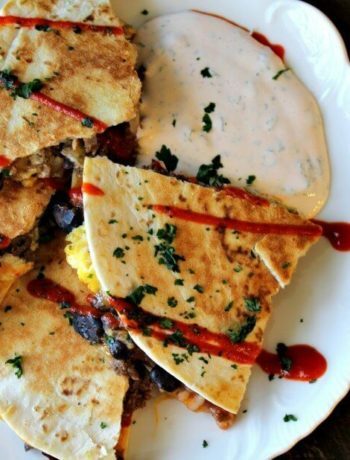 Our favorites are Southern classics with a twist. Made with ❤ in Tennessee.